Setting the room temperature almost always depends on the family’s comfort. But there’s probably one member of your family that’s often forgotten to be taken into consideration: your dogs. Dogs are able to regulate their own body temperatures. As a result, they can easily adapt to the room temperature they’re in and therefore be comfortable, much like humans. What can mess up their comfort level, though, is the impact of rapid temperature changes in the body in response to temp changes in the room. That’s why Desert Star Heating and Air recommends that it’s best to leave the thermostat setting at 78 degrees Fahrenheit during hot, sweltering weather and at 69 on cold days. This is the ideal setting. But if you live in states that experience extreme climates, such as Utah, you may need to try out some room temperatures to get what suits best for your dogs. Check for any problems in your thermostat. There are instances when thermostat problems cause one part of the house to get very cold, while the others remain at the same temp. This can affect your dog’s comfort level. And worse, it could break your AC. Get AC repair specialists in West Valley to make sure your system regulates the right temperature for you and your dog’s comfort. 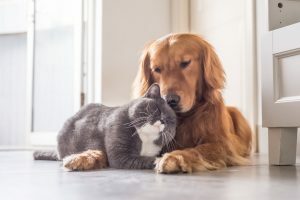 While there’s an “ideal temperature” for your furry friends, the “just-the-right” temperature really depends on a lot of variables. Like the dog’s age. The age of your pet dictates how well they’re able to make use of their senses and control body temperature. The older your pet is, the less likely they’re able to adapt well to sudden temperature changes. Another factor is their breed characteristics. Your dog’s physical and genetic features also affect temperature regulation. For instance, dogs such as Chow Chows and Labrador retriever have double coats, so they have extra insulation that helps them get warmer. If your dog doesn’t have that physical protection, they might be more vulnerable to the cold and therefore should guide you in adjusting your room temperature. Don’t forget your furry friends when regulating temperature at home. You should consider them when considering ‘family’s’ comfort.